ALERT® can be implemented in departments, entire hospitals, across hospital groups and HMOs and in primary care, community care, child health and acute care settings on a local, regional or national level. Do you know ALERT's BUSINESS INTELLIGENCE tools? Clinical management and resource management solutions for a wider overview of healthcare facilities. Provides healthcare facilities with an advanced management software solution for increasing productivity and optimizing services. 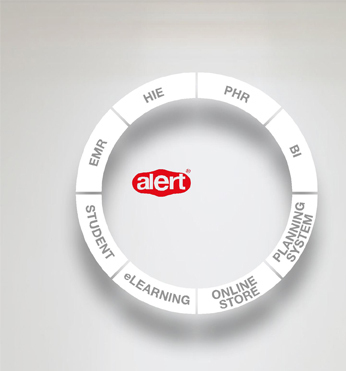 ALERT® CRM supports the information desk in a hospital context to provide useful and real time information. Imagine the potential of having a planning system. ALERT® PLANNING SYSTEM is an application for planning the healthcare facility's activity: Strategic, Tactical and Operational Planning. Learning Management System (LMS) that enables users to receive training in various ALERT® products and profiles via the internet. ALERT® STUDENT provides a knowledge network collaboratively built by a community of medical students, teachers and physicians. Start organizing your own and your family's healthcare information now. You can now share patients' clinical information with other facilities even if they use different clinical and administrative software. ALERT® EMR enables the creation of paper-free clinical environments in hospitals, primary care centers and private practices.